Because since I moved to my current quarters I've had a lot more time to watch DVDs, I've decided to include mini movie reviews on this blog. And what better way to kick it off than with this classic, award winning film? Starring Marlon Brando, Al Pacino, James Caan, Richard S. Castellano, Robert Duvall, Sterling Hayden, John Marley, Richard Conte and Diane Keaton. The Godfather humanized the characters, centered the movie not on the money, the gambling, the violence, or the power, but rather it focused on the family and how it was the Don's and everyone's responsibility to protect the family's interests. It showed that man who we know is probably accountable for the death of numerous people, as a family man, dancing on his daughter's wedding day, playing with his grandchildren... I would describe it as "disturbingly normal". Hehehe. "I'll make him an offer he cannot refuse." Not to say that it did not bring enough excitement to the screen, there were plenty. And if you like seeing people get beat up, shot point blank or stabbed - in the comfort of your living rooms - then this is perfect for you. Haha. I am currently reading a book about Power - how power is directly measured by your influence over people. 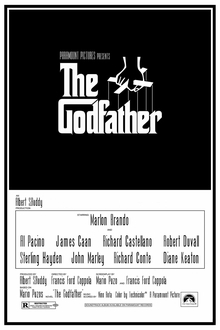 I liked how The Godfather opened the film by showing people how he amassed his power - why he was The Don Vito Corleone. It was actually very cool (and quite terrifying) to watch - how he wields his power and his control over people. I also liked how they portrayed him as a businessman - very smart and strategic, not trigger happy or even at all "evil". I enjoyed how the transition of power happened - it was quite brilliant, like a chess game. Eliminate the enemy, and position yourself well in defense. It was also alluring to watch Michael Corleone transform to become his father - there were moments they actually looked exactly the same in the shape and facial expressions. Finally, I rather liked that they infused the movie with Sicilian flair - the huge celebrations, the closeness of the families, and all the cooking and the eating Italian Food. So I said this will be a quick review - and so I better end this now. I prefer not to give a rating, but rather just recommend that you either "Watch It!" or "Skip It" - I'll save you the trouble if it's a bad movie... not for this one though. The Godfather is a definite must see. "The Godfather (Part 1)" - WATCH IT! How much I love this film , I watched it 2 -3 times each and really like it ! !